This photograph shows a number of workmen from the firm John Thompson & Sons Ltd. outside St George’s Chapel in the late 1920s. A major repair contract was issued to Thompson & Sons in 1920 for the restoration work that was to be carried out to the interior and exterior of St George’s Chapel over the following decade. 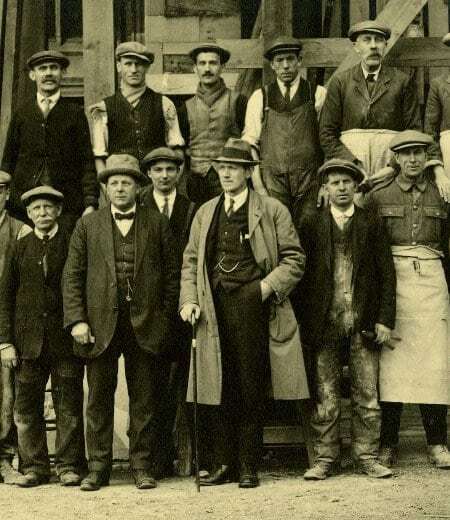 Based in Peterborough, Thompson & Sons was first founded as a small company of stonemasons in the early nineteenth century. By the time of the St George’s restoration project, the firm had built up an extensive portfolio of restoration work to cathedrals, including Peterborough, Chester, Hereford, Lincoln, Ripon, Salisbury and Winchester. The firm had even worked on St George’s Chapel previously, when repairs were done to the nave vault in the 1840s. Pictured here, outside St George’s Chapel, are around two dozen of their workforce. It is a simple photograph that rewards a close look at the details in the individuals that are its subject, from their expressions and attitudes to their clothing. The men in aprons are most likely carpenters and the others – particularly those ones covered in dust – are probably stonemasons. One man in the front row is still carrying some of his tools. Standing just off-centre in the group, more smartly and cleanly attired than those around him (notice the shine on his shoes), is Robert Burns Robertson, the Chapter Surveyor, who would have worked closely with both Thompson & Sons and consulting architect Harold Brakspear throughout the years of the restoration. It is possible to see the pen and paper in the breast pocket of Robertson’s waistcoat and the fob chain of his watch, testifying to the more supervisory nature of his role. He is also sporting his customary trilby, which makes him the only man in the group aside from the foreman beside him not to be wearing a flat cap. The 1920s restoration project was brought about because Harold Brakspear, consulting architect to the Dean and Canons of Windsor, 1906-1934, determined that the ceiling vaulting of St George’s Chapel was fractured in many places and the north and south walls were slanting out, by 2 and 6 inches respectively, partly due to the poor foundation of some of the walls on a clay surface that covered the chalk outcrop on which Windsor Castle stands. Brakspear and fellow architect Charles Peers set up ‘tell-tales’ across the cracks in the stone vaults of the Chapel in 1920. These subsequently snapped, proving to Brakspear and Peers that there was significant structural movement taking place. A programme was urgently needed to replace the failing structure of the Chapel and to repair the damage that had already been done. In January 1921 Thompson & Sons erected a construction yard on the south side of the quire and constructed wooden scaffolding to support the failing building and a hoist to lift building materials. Cutting new stone for buttresses began in February. Employees of the firm would remain on site at Windsor until December 1930, when the necessary work was finally completed. Aside from preventing the complete collapse of the Chapel, the ten-year restoration project that was overseen by Brakspear was responsible for changes to the Chapel which are familiar today, including re-colouring the heraldic bosses in the nave aisles, replacing the leaded roof domes over the Beaufort and Urswick chapels and reinstating the kings beasts, which had been absent from the Chapel roof since the 1680s. 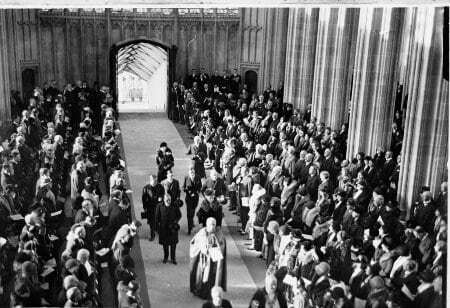 A re-opening ceremony and service of thanksgiving took place in the fully restored Chapel on 4 November 1930, attended by King George V and Queen Mary. In 1931, Harold Brakspear was honoured with a knighthood for his work to the Chapel. St George’s Chapel Archives holds several collections of correspondence from the time of the restoration, including letters between Robertson and Brakspear regarding the restoration work, 1924-31 [SGC M.114/15]; letters between Brakspear and Thompson & Sons, 1924-26 [SGC M.114/16]; correspondence between Chapter and Brakspear, Robertson, Thompson & Sons and others regarding the restoration work, 1908-31 [SGC XVII.59.2] and notes compiled for Dean Baillie by Robertson on the condition of St George’s Chapel and a copy of the Dean’s letter to the press on the condition of the fabric and the financing of the restoration, 1920-21 [SGC XVII.30.20].